Milla Moilanen’s awarded animation WANTED (11 mins, 1999, 4K/DCP/35mm) at the Brest International Short Film Festival, Nov 8th 2017. 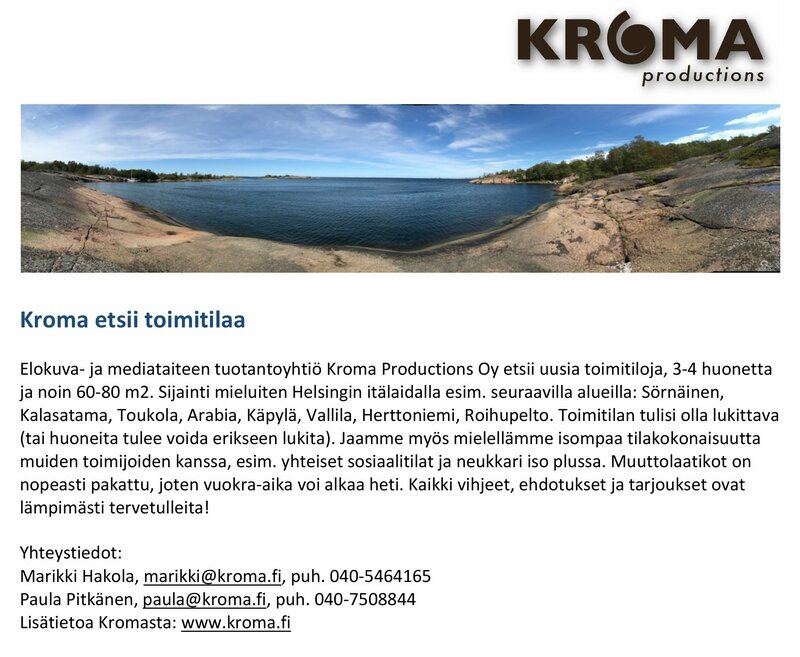 Producer Paula Pitkänen joined the Kroma team. Welcome Paula! “Tales from Frontiers” at the ARTEGROUND BALTIC 2017, Viljandi, Estonia, 28.-29.8.2017. Marikki Hakola’s early work “The Time is Right for…” at the Summerhall, the Edinburgh Summer Festival 2017. Kroma attending Avant Première 9.-19. February 2017. Kroma at the ECACon2017, London Feb 3rd 2017. “Tales from Frontiers” at the LUMO Light Festival in Oulu 18.-20.11.2016. Marikki Hakola, Maya Deren and Meredith Monk, in flux: artists’ film screenings at the Hales Gallery London New York, 26 July – 6 August 2016. Turppi Group Exhibition “Turppi Games 82-83” at the EMMA museum Espoo, 6.-9./2016. Marikki Hakolan varhaisia videoteoksia 80-luvun taiteen “Palavat tornit” näyttelyssä Kouvolan taidemuseo Poikilossa 19.5.-4.9.2016. Kroma has become a member of the international Event Cinema Association ECA in October 28th 2016. TALES FROM FRONTIERS, a video documentation and interviews.